There are numerous reasons why SMS texts in Android can fail to send (or be received, but this article will focus on failure to send). If you cannot receive SMS texts, read this Appuals article “Fix: Phone Not Receiving Texts (Android)”. It is an entirely different issue. However, if you can receive texts just fine, but your texts always fail to send, it is 9 times out of 10 a problem with your SMSC number. It is not a hardware or software issue, factory resetting your phone will accomplish nothing. This is because the SMSC number is actually written to your SIM card, not on your device. In this article, we will show several methods for fixing the SMSC number on your Android device. An often overlooked problem is an incorrectly set SMSC number. The SMSC is responsible for sending SMS messages from your device. When you send an SMS message, it gets forwarded to the SMSC, which then sends it to the destination. Your SIM carrier is responsible for maintaining the SMSC network. There are numerous ways your SMSC may have been inadvertently incorrectly configured or outright deleted. 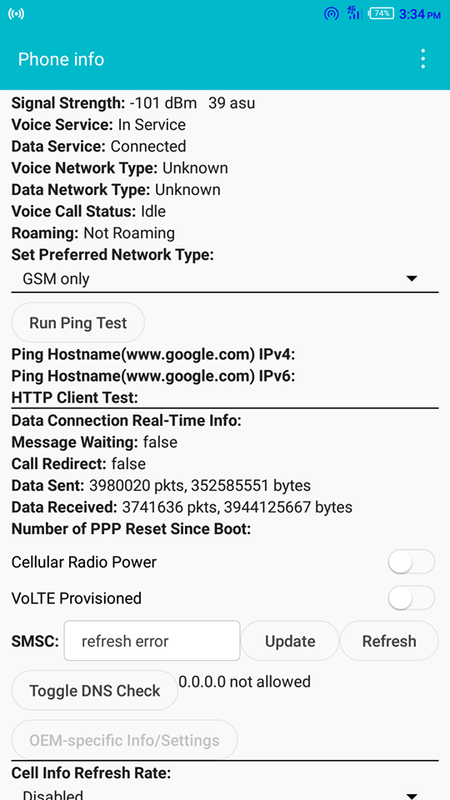 In this writer’s personal experience, my SMSC was erased when I downloaded a root app that would supposedly enable VoLTE. Lesson learned – apps that “tweak” your telephony settings are probably a bad idea, if you don’t know exactly what they’re doing. This method works for most – it is the most commonly recommended method on other websites. Personally, it did not work for me. When trying to add my carrier’s SMSC number to the appropriate field, the menu would give a “failed” error. This was whether or not I converted the SMSC to PDU (as other websites also recommend). So if this method also fails for you, try the next one. Bring up your phone dialer. A menu will launch. Choose “Phone Information”. Scroll down to SMSC, and tap ‘Refresh’. This should automatically try to correctly set your SMSC number. If it fails (‘Refresh error’), you can try manually setting it. In the field for SMSC, enter your carrier’s SMSC number. After you have entered the SMSC number, tap ‘Update’. If you do not know your carrier’s SMSC, you can try consulting a list of global SMSC numbers for the most popular carries by country. However, these lists can be outdated – it may be best to contact your carrier to get the correct SMSC number. If you receive ‘Update error’ when manually adding the SMSC, many websites recommend converting the SMSC number to PDU format. This did not work for me personally, but I’m listing the steps incase it works for you. Go to this website – Online PDU Encoder and Decoder. Scroll down to the bottom of the page, where it has a field for SMSC to be converted. Erase whatever text is in the fields for “Receiver” and the message box above the “Convert” button. Enter your SMSC number in the SMSC field and click convert. The right side box will produce a string of letters and numbers. You need the first 16 digits on the 2nd line (highlighted in our screenshot). Enter this PDU number into the SMSC field, and try hitting “Update” again. If it still fails, try adding a + sign to the beginning of the PDU number. If it still fails, try the next method. Many of us like to download alternative texting apps than the stock one that comes with our devices. Apps like Textra, Chomp, EvolveSMS, and even the SMS feature in Facebook Messenger seem like fancier alternatives to the stock app. If you’re a root user who likes to debloat your phone, you probably also disabled the default SMS app. The funny thing is, the default SMS app usually has an option for setting the SMSC number, whereas most third-party SMS apps do not. This is typically because the default SMS app is a /system app with privileges to modify the SMSC, whereas the third-party apps are not. If any of this sounds like your scenario, try this. 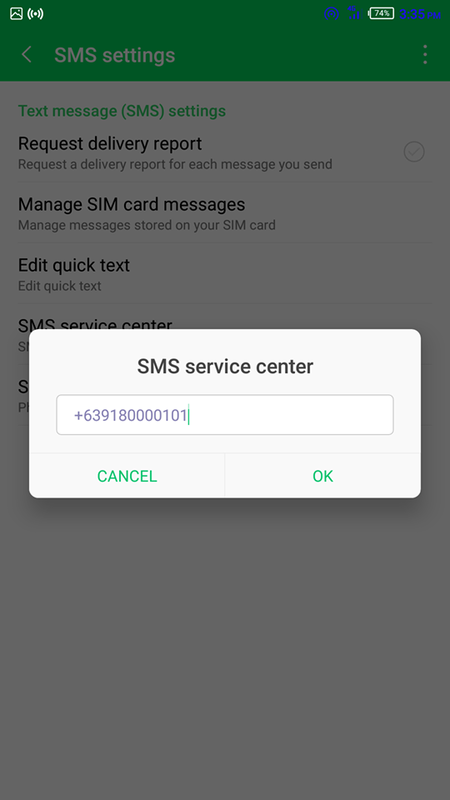 Setting SMSC in default SMS app. Go to Settings > Apps, find your stock SMS app (the one that came pre-installed on your phone). Tap it, and make sure its not disabled. If it is, enable it. Now launch the SMS app, and look for the SMSC setting. In my device, it was located in the app’s Settings > SMS settings > SMS service center. Enter your SMSC, save it, and try to send a text message. If it sent, problem solved! You can now switch back to whatever SMS app you prefer, but do not disable the default SMS app. The third-party apps may actually rely on the default SMS app’s configuration. If nothing has worked for you so far, some people report they are able to fix the issue by setting the SMSC in a different phone, then putting the SIM card back in the one with issues. Pull the SIM card out of your device, and stick it in a different phone. Even an old Nokia should work for this. Find the SMS / SMSC settings in the other phone, and set it properly. Its important to remember that SMSC settings do not actually get saved to a phone, they get saved to the SIM card itself. So the correct SMSC configuration will carry over when you switch it back to your regular phone. “I put my sim card in old Nokia 6120 C, then this time I change the SMS Configuration. I renamed the title used there. I Change from “Pusat Pesan SMS” to Message Centre. This time it succeeded.”.